One of the most common suffrances people have is joint pain. 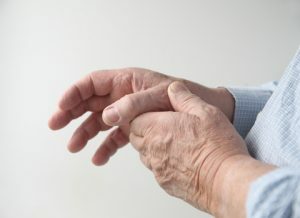 That one limb you tweaked in your active days, your hands and knees after years of working, your wrists from using modern devices, or just the creaks that come with age… we all have little complaints that build up over time. Figuring out what to do about it is different. Some can ignore the complaint until the pressure outside drops, or they try and use the joint. Others have a general throbbing that’s become background noise. A few suffer from a constant reminder that the joint is injured, and struggle to find adequate help. Don’t ignore your joints, it can only get worse over time. In addition to whatever physical restraints or physical therapy exercises a doctor may recommend, support joints with Joint MGRx. Formulated according to the strongest, most up-to-date research, Joint MGRx supports joints by giving them the nutrition they need, fighting inflammation, and supporting the surrounding connective tissue. It’s a non-addictive solution to work toward long-term results like better flexibility, less pain, and improved strength. The star ingredient of Joint MGRx is Glucosamine. Glucosamine is a precursor to a component of cartilage, or in other words, it’s an important nutritional building block to what is often a heavily impacted and sensitive part of the joint. Making sure the body has enough building blocks for repair is one step toward better health. Joint MGRx is one of the best rated, most requested dietary supplements from the Welltrients line. If you’ve dealt with joint pain or injury, it’s easy to imagine why. Like all Welltrients, it’s fully loaded with all the best ingredients, and free of additives like stearates and the fillers that other brands use. Don’t wait any longer to support your joints. Give Joint MGRx a try today. Next post: Could Your Thyroid Be Working Better?